We might need to declare this ‘lunch recipes’ week…although any of the recipes could be served for a simple supper on a busy weeknight, they’d also make for a delicious lunch. In fact, I’m skipping a salad for lunch today and having sliders instead. I’ll be back to salads tomorrow, and sharing a crazy delicious new salad with you on Friday! 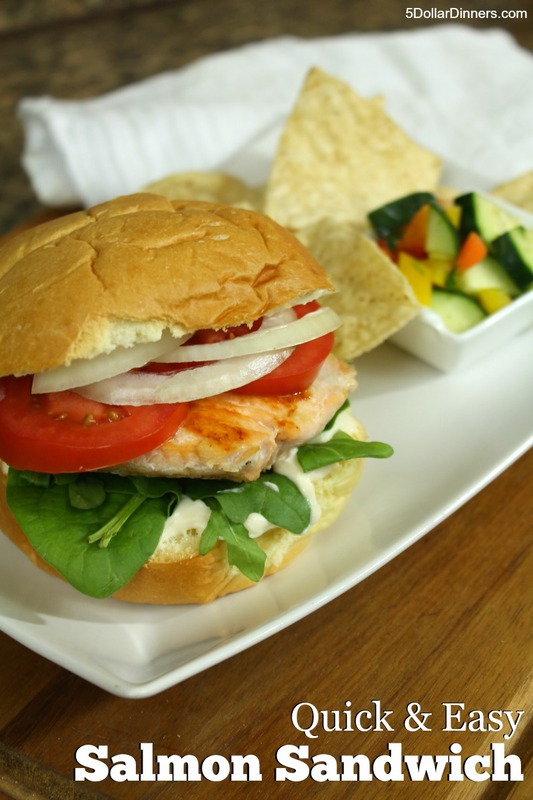 I don’t share too many seafood recipes on the site because seafood is significantly more expensive than other meats…so I buy it only when on sale and can make something delicious with it…like this simple salmon sandwich. Note about salmon prices: always check the tags in the seafood case as you stroll by. I’ve found that seafood is often on sale, but not advertised in the store sales ad. It’s goes on loss leader or special on occasion, but I usually find the seafood sales by browsing the case, not the ad. Your store might be different, but I’ve noticed this in 2 stores in 2 states, so…take note! If you have some Parmesan cheese on hand, you could jazz up the mayo like this. Or mix it into an aioli like this. Or just keep it simple and let the salmon flavors shine! Heat avocado or olive oil in saute pan over medium high heat. Season the salmon lightly with salt and pepper. Add salmon to pan and cook the salmon 4 minutes on each side. Salmon will easily flake with your fork when it’s done. Spread mayo on the buns and add the remaining sandwich ingredients. 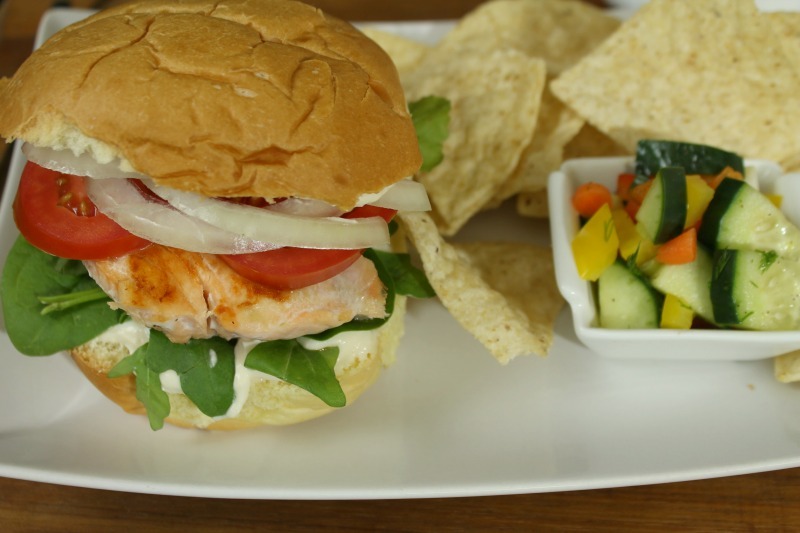 Place salmon on your sandwich and enjoy! My husband & I love fish, but it always seems expensive. At what price would you normally purchase salmon? Seafood especially salmon is worth the extra $$! !